Poet Christopher Lee Miles: I suppose the relationships between the speaker and his grandfather, the speaker and nature, nature and the grandfather; and the attitude of the speaker toward the superstitious, but etiological, beliefs of the grandfather. I hope one would ask: Why are these believes in contradiction? Or aren’t they? What about the intuition the speaker feels? What could this mean? Artist Kara Searcy: The last two sentences for sure! Those last two sentences pull the poem together, and the idea of a cycle that repeats itself endlessly made me want to go back and re-read the poem so I could look for that kind of pattern in the poem. Poet Christopher Lee Miles: Oh my yes: color—the melting of it. The landscape of the painting seems to deepen in the upper right hand corner and come much closer to the viewer’s eyeballs on the left side. I think this abstract, but very concrete, piece reflects, and refracts, the elements swirling in the poem, from the relationships to the syntax. It’s like looking at something which is stationary and solid, and yet, somehow, gives me a joyful sense vertigo. Artist Kara Searcy: The poem is really strong as it stands without a painting, so to have it off to the side of the painting seems fitting—it can still maintain that strength, and it allows the painting to accent it. The two peices defnitely play off on another this way. 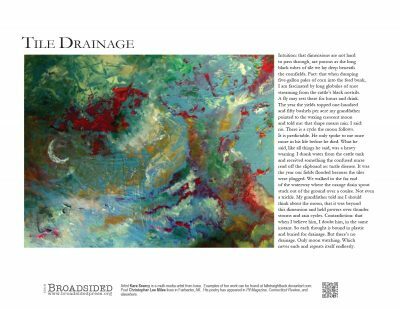 Poet Christopher Lee Miles: As I mentioned above, the depth of the painting, how the colors highlight the movement of the poem, and how the poem benefits the painting. Artist Kara Searcy: At first I thought I would paint a scene from the poem, but as I let the painting move, the simple image of the moon seemed to be what the painting wanted to focus on. The red was an afterthought, and it ended up brightening the painting up, so I kept it. Poet Christopher Lee Miles: My girlfriend is a visual artist. When she introduced me to the work of Gustav Klimt, there was a bit of a revolution in how I thought about, not only my art, but Art in general. I’ve written several ekphrastic poems in response to Klimt—none live up to his work or the reverence I feel for it. I may go back and edit the poems further and see if I can squeeze something lasting out them, but for now, they are exercises in a personal homage. If you had to represent the Broadsided of “Tile Drainage” with one word, what would it be? Poet Christopher Lee Miles: Yes, The Metamorphosis by Ovid, and Of No Country I Know by David Ferry. Artist Kara Searcy: More Than A Carpenter by Josh McDowell. How do you want your poems to seem, or feel like, to the reader? Poet Christopher Lee Miles: Lucid, but with a powerful undertow consisting of deeper questions, of an almost-obscure, yet alluring mediation, that demands thought on the part of the reader, and rewards that reader greatly for their effort. Poet Christopher Lee Miles grew up on a small farm in Minnesota. His work has appeared in Connecticut Review, Cortland Review, South Dakota Review, and is forthcoming in Atlanta Review and War, Literature, and the Arts. He was a finalist for the 2011 Ruth Lilly Fellowship Prize. He served four years in the US Navy, which included deployments to both Operation Iraqi Freedom and Operation Enduring Freedom. He lives in Fairbanks, Alaska.